Nature’s engineers are back on our pond. Unlike the two-legged kind, they don’t set up orange cones around their work sites — but we’ve learned to recognize the signs of their activity all the same. One is the growing pile of saplings, freshly trimmed of their bark, on top of the beaver lodge at the water’s edge. We’ve also seen their logging roads — muddy ruts running down to the water from stands of poplar, maple, birch, and alder. John Kulish, in Bobcats Before Breakfast, calls beavers “Mother Nature’s Corps of Engineers,” and even offers a tongue-in-cheek course guide for the “technical school” that all young beavers attend. Kulish’s courses include “Introductory Tree Identification, Advanced Selective Cutting, The Natural Philosophy of Water Pressures and Currents, Scientific Erosion Control, Tunnel- and Canal-building,” and more. Young beavers stay with their parents a full two years, partly to attend what might as well be called their community college of logging, dam-building, lodge construction, and winter food management. At this time of year, these fur-covered civil engineers work the third shift, from nightfall to daybreak. Using nothing more than their four large front teeth, called incisors, and their powerful jaws, beavers can cut down trees 4 feet in diameter. They eat the bark of the trees and use the remaining wood in their lodges and dams. We haven’t seen any signs that our neighboring beaver community has grown, but kits may have been born in the lodge earlier this spring. If so, they may already be taking nighttime swims with their mom, their heads just nosing up above the surface of the water and their signature V-shaped wakes trailing behind them. If we’re lucky, we may surprise a beaver on its regular rounds and hear one of the loudest sounds in nature, the slap of a beaver’s broad tail on water. 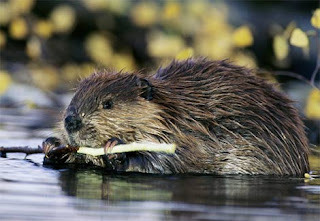 - The beaver is the largest North American rodent, at about three feet in body length and another foot for its tail. Beavers in northern New England commonly weigh 30 to 70 pounds, but can grow to be more than 100 pounds. - A beaver has two pairs of eyelids. An inner, transparent pair acts like a scuba diver’s goggles, protecting the beaver’s eyes while it’s underwater. - It’s estimated that 60 million beaver gnawed at North American forests before the Mayflower landed. Beaver pelts became the currency of the Massachusetts Bay Colony. The trade went so well that the new colony was debt-free by 1640. - When the New Hampshire state legislature voted in 1905 to give beavers protected status, they had been hunted so intensively that none could be found. The large rodents were reintroduced several decades later, and the population has since re-established itself across the state. - National Geographic facts about beavers. - David Attenborough narrates this BBC video of beavers building a lodge. - Although sadly no longer in print, John Kulish’s book, Bobcats Before Breakfast, is worth borrowing from a library or finding used for interested readers ages 9 and up.